This weekend Daisy and I held our baby shower at our home and a good time was had by all. The food, the games, and friends and family made it what a baby shower should be: a joyful occasion (the competition to see who could empty a baby bottle of beer fastest didn’t hurt either). Of course, we were showered with gifts which is the not-so-subtle point of a baby shower, and some of those gifts were bird-themed. Today I will share with you one of those wonderful gifts, a quilt my mother made for our due-in-November son. My mom is a long-time quilter and over the years her design and execution have gotten better and better (not that her early efforts were in the least bit shabby). We are thrilled with this gorgeous quilt loaded with fancifully-colored birds and think that little Upopa Epops (Jochen, you’ll be sad to learn that Daisy has rejected Willet as a name, though it did make the possible list, and I think it goes without saying that Upopa Epops wasn’t even given a fair hearing) will love looking upon it. Wait, looking upon it? Aren’t quilts to cuddle up in? 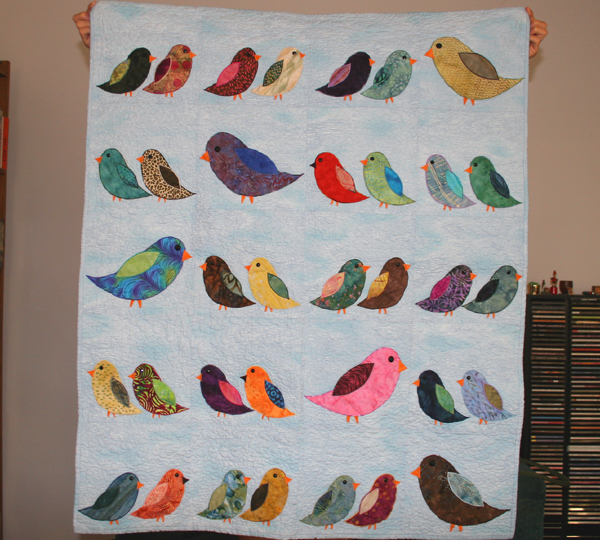 Well, yes, most quilts are to cuddle up in but this particular quilt is actually meant to be a wall hanging because the buttons used for the birds’ eyes would be a choking hazard. It will look wonderful hanging in the room we are turning from a computer room/guest bedroom into a nursery. It’s great to be a birder with such wonderful family and friends who were so kind as to show at the shower and share in our joy. And even better to have such a talented and caring Mom who can make such a sweet work of art to adorn our walls. Thanks, Mom! Those are some mean neon partridges! I love it! That is a wonderful gift. I expect it will become a family heirloom. Aren’t we supposed to guess the different species? One of those birds resembles a Pink-headed Warbler but after that, my guess is they’re all Old World exotics. That’s sad about Willet getting rejected. I’ll have to send you another quilt with pictures of Willets but mind you, I have none as I have seen none. Oh man, I hate it when a plan does not come together. Ooh Willet as a name sounds quite good. I may broach that one with the other half when the time comes. That’s a wicked quilt! Little Upopa Epops is gonna love all those colors. Does that mean that Dickspiza is still on the list of possible names? OK, to give credit where credit is due. The quilt is not an original creation. It is from a pattern in a quilting magazine. Here is where I am supposed to name the magazine, but unfortunately, I loaned it to a friend and I can’t remember which one it is–the magazine, not the friend and she loaned it to her daughter…Also, I did the piecing and the applique, but my friend Mary Metty did the machine quilting–it was too big for my sewing machine. The quilt was great fun to make, from selecting the colors to finishing the binding. Also, all the bird fabrics came from my stash—I have a LOT of fabric. Made with love for Corey, Daisy and baby Shearwater. Interesting, Beautiful bird themes. This would be one of the most wonderful baby gifts. Thanks for sharing. So can you identify all the birds on it? What a wonderful quilt! All of that beautiful handwork! Great job! Beautiful quilt Jill. I bet Desi loves looking at it. Thank you for sharing your baby quilt – I replicated it (from the pictures only) and made one for my niece. 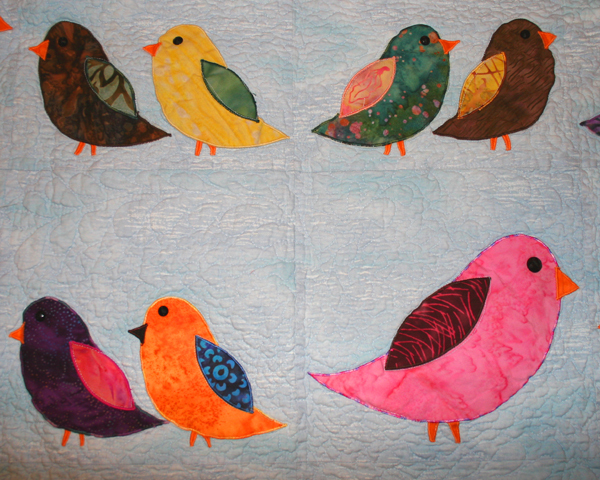 It is a little bit different, I hand quilted around the squares and birds and added a bright coloured border. It is lovely, and I just want to say thank you one more time for the inspiration. hi! love the quilt. 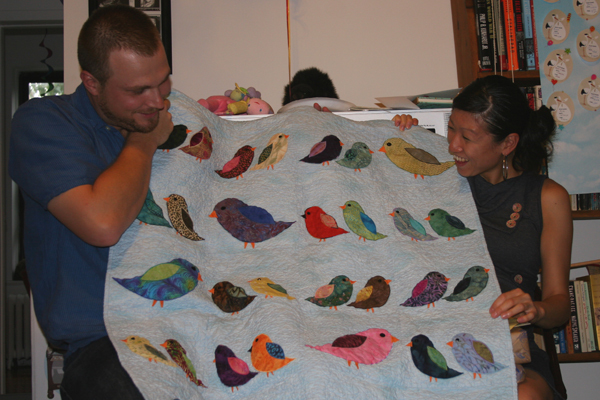 my husband is a birder and we would be interested in finding out if your mom does work on the side for quilting. thanks. First, I want to tell you I think that your quilt is the most beautiful quilt I have ever seen. Just gorgeus!!! 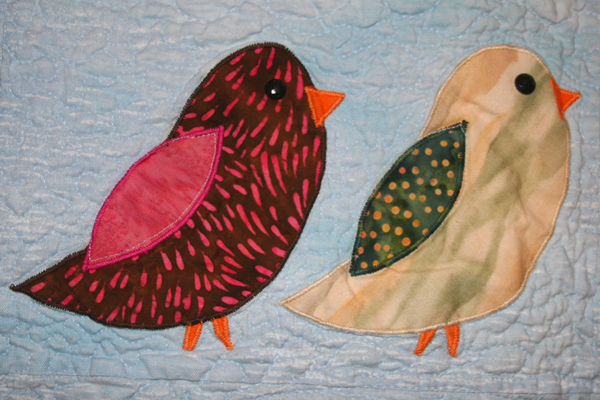 Could you tell me …did you quilt the fabric then add the birds?